CONGRATULATIONS ARE IN ORDER FOR THE WOLF WITH WANDERLUST! In 1995 the United States Fish and Wildlife Service (USFW) reintroduced wolves into the United States from Canada to Yellowstone National Park and the State of Idaho. The wolves have been steadily moving westward, increasing their populations and territory. Once hunted to extinction in the State of Oregon, by 2000 wolves were here again. A success story to be sure, but no one expected the human interest story of a lone grey wolf his search for his place in the world. OR-7, also known as “Journey,” a tagged, young, male, grey wolf from the Imnaha pack in the northeast section of Oregon had wanderlust. In 2011, he was a two-year old seeking his own territory and a mate to call his own, OR-7 endeavored on a three year journey walking thousands of miles across the state, stopping briefly in Central Oregon, and headed south to California. As he walked farther and farther away from any known wolves; many thought he was making a futile trip, where only loneliness awaited him. Journey wandered into Northern California in December of 2011 making him the first wild wolf to walk on California soil since 1924. For a time it seemed that he couldn’t find where he belonged but last year he returned to Oregon. His amazing trek made that much more amazing by the fact that, according to the U.S. Fish and Wildlife Service, he did not attack any livestock along the way. In May of this year, a black female grey wolf was spotted (it is still unclear where she is from) in the same general location and it appeared that Journey had finally found a mate. The pair established a territory in the southern Oregon Cascades in the Rogue River-Siskiyou National Forest. 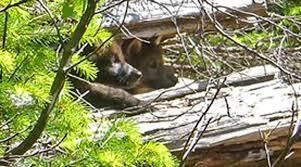 It wasn’t until June 5th when officials reported two wolf pups, approximately 5-6 weeks old, had been located in a fallen log. It is possible that there are still others. “Litters are typically four to six,” said Michelle Dennehy, ODFW spokeswoman in Salem. There are mixed reactions to the new family; from excitement to trepidation. “This is very exciting news,” Paul Henson, state supervisor for the Fish and Wildlife Service said in a news release. “It continues to illustrate that gray wolves are being recovered.” Rob Klavins, northeast Oregon field representative for Oregon Wild said, “This demonstrates that wolves are surprisingly resilient and, given a chance, they can do pretty well.” But ranchers are concerned that a new pack could spell trouble for them in the future. Education will be key for the two to coexist in the future. Oregon Fish and Wildlife officials have offered advice to ranchers for mitigating potential conflicts. For the time being, Journey’s wanderlust is no more and his new family will start a new chapter in wildlife conservation in the American West. 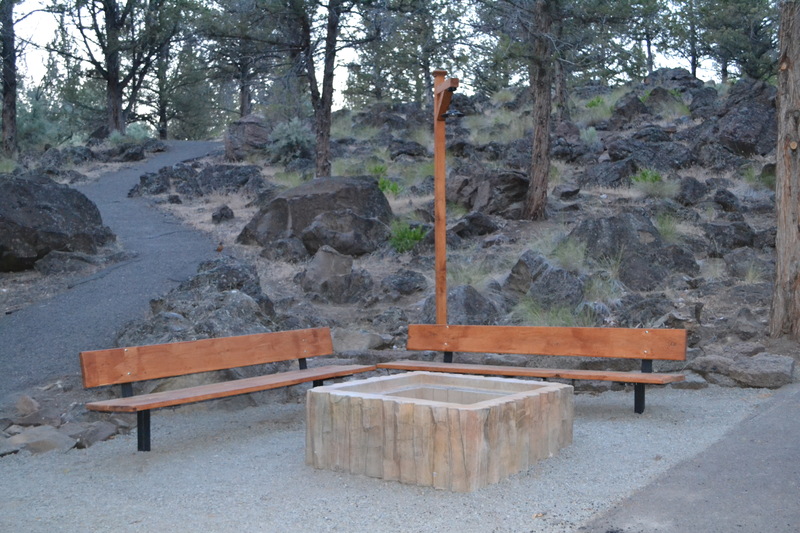 The Deschutes Campground Amphitheater got a major face lift this spring. Located in B-loop, the amphitheater was in tired, sad shape so five dedicated volunteers, in just two and a half weeks, fixed it up. The old amphitheater was originally built in 1970. It’s had work done to it over the years by volunteer groups like the Tel Com Pioneers and a number of camp hosts; however by 2014 it was suffering major decay and damage from termites, vandalism, weather, outdated design and age. David Slaght, Park Manager, agreed to the renovations earlier than planned to ensure visitor safety. The new amphitheater, named Camp Coyote, was designed to give the feeling of an old, retro-styled summer camp. 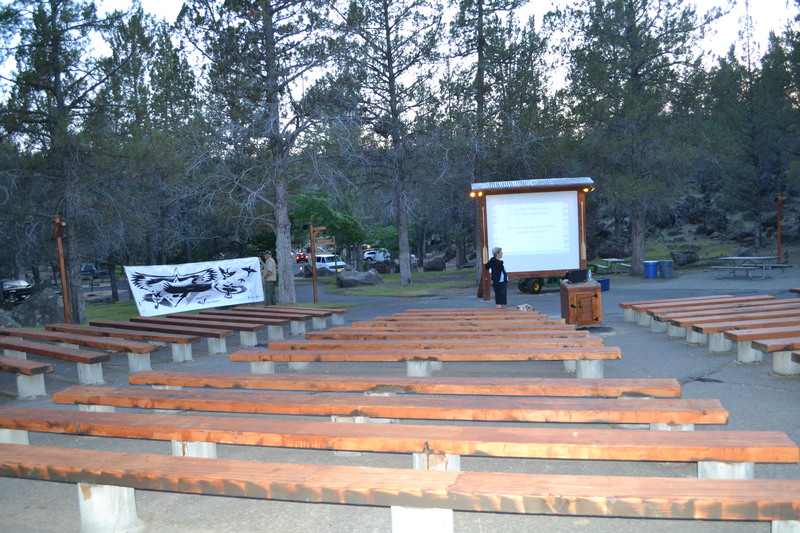 A new screen was erected, the stage was removed as it was a tripping hazard, the podium was replaced and rewired for power, new solar lights were installed for safety, some benches were replaced, while others were sanded and all were stained, cracks in the asphalt were filled, the fire pit was moved so that visitors can stay warm and see the screen, and a new junior ranger area was added. Bird feeders, rocks and new plants, a bat house, and canoe paddles all make the area a lot more welcoming. 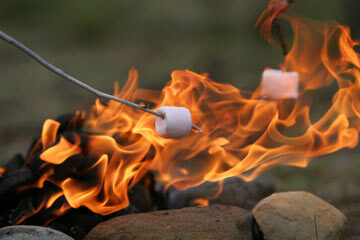 So when you visit The Cove come by Camp Coyote; relax around the fire, learn some fun facts, and roast a couple of marshmallows. Kids will love the Junior Ranger area. Special Thanks to my volunteers, Jim Bennett, JC Bennett, Justin Bennett, Chris March and Jerry Morey – you guys did a great job!